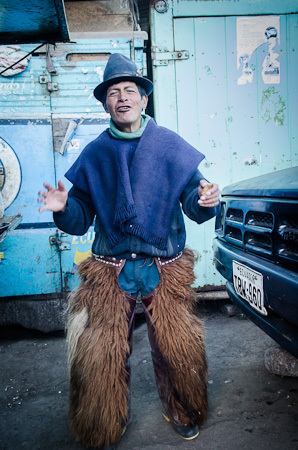 Blame it on the moonshine; Riobamba, Ecuador. After several hard days of backcountry riding from Quilatoa, I’ve finally made it to Riobamba – Quechua/Spanish for the ‘river on the plateaux’. Unfortunately, my lax attitude towards water and street food may have caught up with me (though I blame it on the moonshine, pressed into my frigid hands by that poncho-wearing cowboy in Rio Blanca), since I’m having to take a couple of days off, nursing a sore, gurgling belly. The ride here, following little travelled dirt roads that rollercoasted up and over the páramo, was a beautiful and adventurous one. Report to follow. Moonshine? What’s not to like? It’s just fermented sugarcane, that’s all. We call it punta. I drink it all the time. 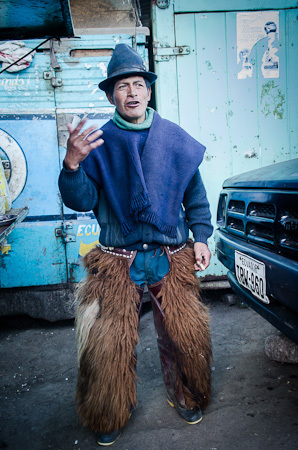 It’ll sure warm you up on those cold nights in the páramo. 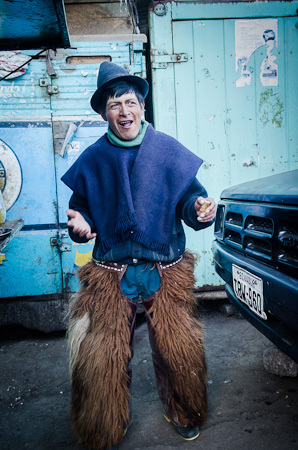 That, along with these here llama-wool chaps. Yeah… Er… What was I saying? This entry was posted in Ecuador and tagged aguardiente, Ecuador on June 16, 2012 by Cass Gilbert. Is it just me or does he look remarkably like Paul Newman? Maybe he’s a descendent of Butch Cassidy. Hope you can get some Alka Selzer…. get well soon! I love seeing doppelgangers in the most unlikely of places. The other day I spotted an Ecuadorian Christopher Lambert. If it was 190 proof I guarantee that nothing was growing in it! That guy does look like Newman so you should have known he was trouble. 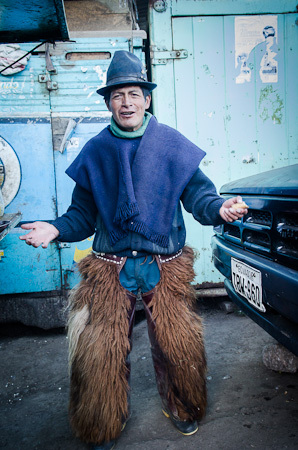 Sure would like one of those Ecuadorian felt hats. Let me know if you can send one, and of course, I’d pay.